Having seen the Avengers movie and caught some information about Black Widow (or Natasha) through Hawkeye’s comic book, I was fairly eager to learn a bit more about her history and see more about her as a character. I’ve noticed that it seems fairly normal in the Marvel universe for some heroes to start off as villains and then become heroes. I was quite intrigued to see Natasha as villain, semi-hero and then completely heroic. 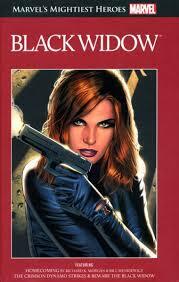 It was good to see the different styles of comics that Natasha was a part of. The first two comics, while containing some scenes of violence, were much more family-friendly… while the next six were much darker in tone and in the violence that was shown. I found myself empathising with Natasha quite a lot. She came across as a strong female character, though I noticed that she seemed more willing to get her hands dirty and battle in the later comics. In the first one especially (and in Hakweye’s version), she seemed to manipulate people more emotionally and let others do the violence. I found her evolution from the first comic to the final ones quite an intriguing one and it would be good to see more of her and about how she evolved as a character. The pheromones thing in the final comic was quite an intriguing one and I thought it was interesting how Natasha knew what was going on, but couldn’t do anything to stop it. I would have liked to know more about Natasha’s past, too. It was strongly implied that there were others who were Black Widows, but it seemed like Natasha didn’t ask for all the answers. I could understand why, but I still would have liked to learn a bit more about her history and what made her who she was. It did seem that the later comics contradicted the earlier ones a little. That might be because I’ve only read part of the storyline, though. I liked Natasha when she decided to get involved to save the girl who was being attacked. I didn’t like Phil’s character much, even though he did seem to be a little more likable towards the end. It was also good to see more of the other characters from the comics and how Natasha interacted with them. This collection definitely made me interested in learning more about Natasha and it was interesting to see her history in the comics and read about her relationships with the others.